Drum Corps International helps thousands of students each year develop their musical and performance abilities, while also improving their self-confidence and maturity. The drum corps experience also goes a long way in helping the performers develop leadership skills, and each year, DCI recognizes a number of these student leaders with scholarships and awards. 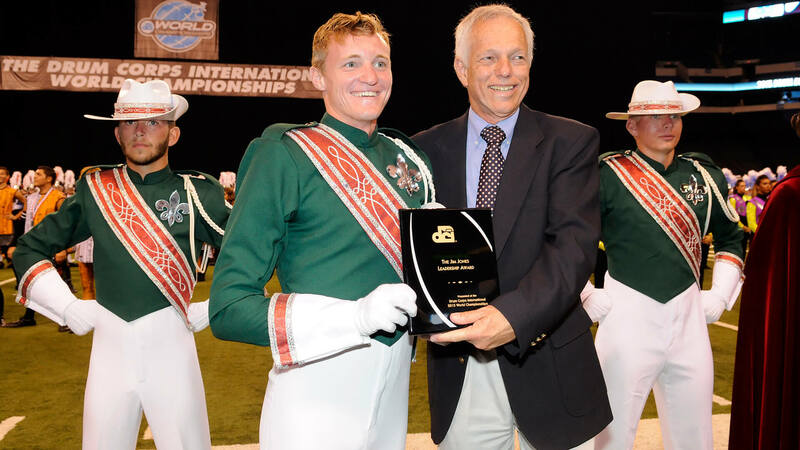 The Jim Jones Leadership Award, presented to one drum major in Open Class and World Class and selected by a committee of DCI Hall of Fame members, was awarded to Eric Perry of the Madison Scouts and Carl Huang of the Vanguard Cadets. Perry, a music education major at the University of Texas at Arlington, is the third drum major from the Scouts to win the award in the past 18 years. He said that he never expected for a moment to win the award. However, Perry’s director, Chris Komnick, wasn’t surprised at all by the selection. Perry passed the credit off to his teachers and mentors who have helped him, including a leadership camp that the Madison Scouts debuted over the past offseason. “Our staff has done an incredible job putting together a leadership program that has been put into place this past year, and it just led until now,” Perry said. “I credit my success to all of that and all of the staff members who have helped me along the way." Open Class winner Carl Huang also was thrilled to receive the award. Huang, 18, studies microbiology and neurological and physical biology at the University of California, Davis. Other scholarships were also awarded on the field at Lucas Oil Stadium in Indianapolis following the DCI World Championship Semifinals on Friday, August 7. Erika Plez of the Jersey Surf and Ruth Williams of the Boston Crusaders were the recipients of the two Friends of DCI Scholarships. Kelley Ho, drum major for the Mandarins, received the Gary Czapinski Memorial Scholarship. Jeremy Stevens of the Cavaliers received two scholarships: the Rodney Goodhart Memorial Scholarship, and the George and Patsy Bonfiglio Scholarship, which he shared with Carla Lackey of the Cadets. The Fred J. Memorial Music Education was awarded to Austin Armstrong of the Madison Scouts. Six students received the Dutch in DCI Scholarship, awarded annually to performers from the Netherlands. Since 1980, more than 150 Dutch citizens have marched in DCI drum corps, and this year, Jubal, a corps from the Netherlands, made multiple appearances on the DCI Tour and at the DCI World Championships. The students receiving the Dutch in DCI Scholarships were Gerjo Bommelje of Phantom Regiment; Rik Dokter of Spirit of Atlanta; Erwin de Yong of the Colts; Demy van der Jagt of the Boston Crusaders; and Bjorn Nahon and Melissa Bliek of the Colt Cadets. In total, scholarships were awarded to 12 of the best and brightest performers DCI has to offer, representing 10 corps.